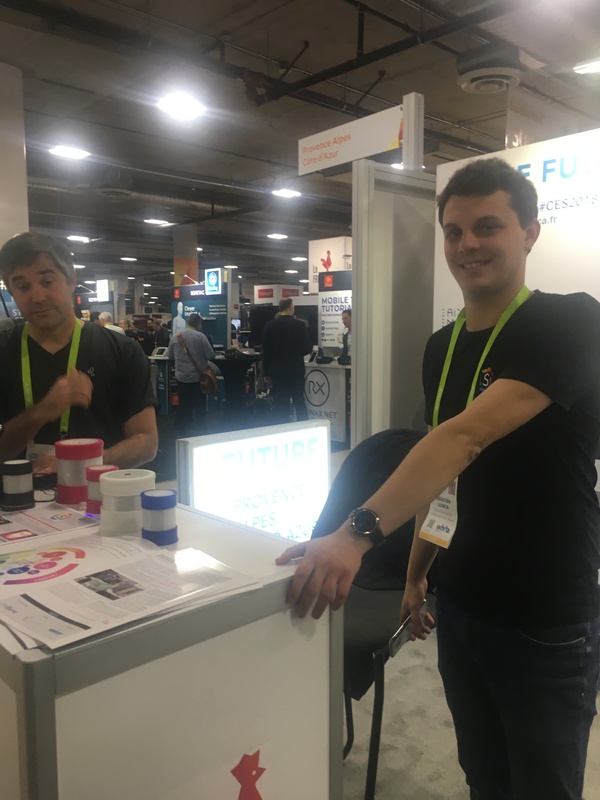 WID staff member, Kat Zigmont, attended the 2018 International Consumer Electronics Show in Las Vegas, Nevada. The following is her report on the event. 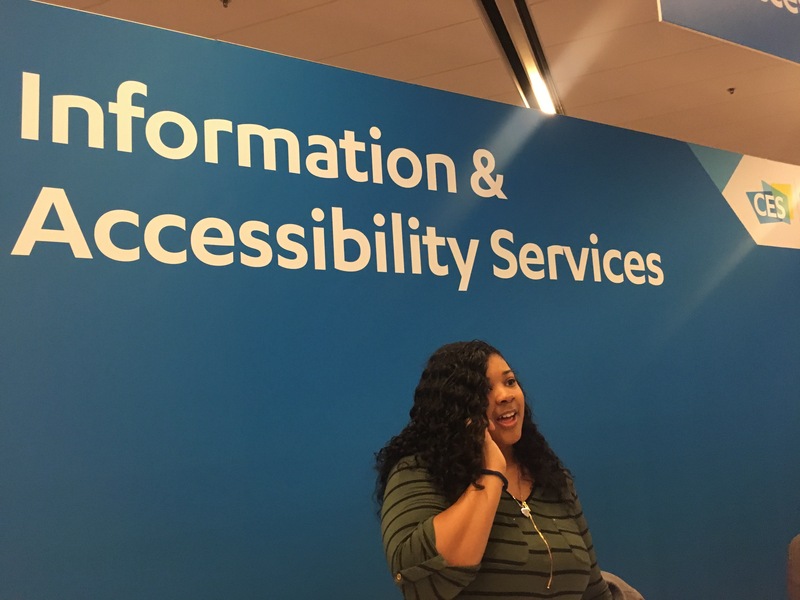 At the CES 2018 convention, we had excellent service from the Accessibility Services team. We were informed that there were eight sighted guides working at any given time. The service was friendly, flexible, and accommodating to the needs of the convention participants. 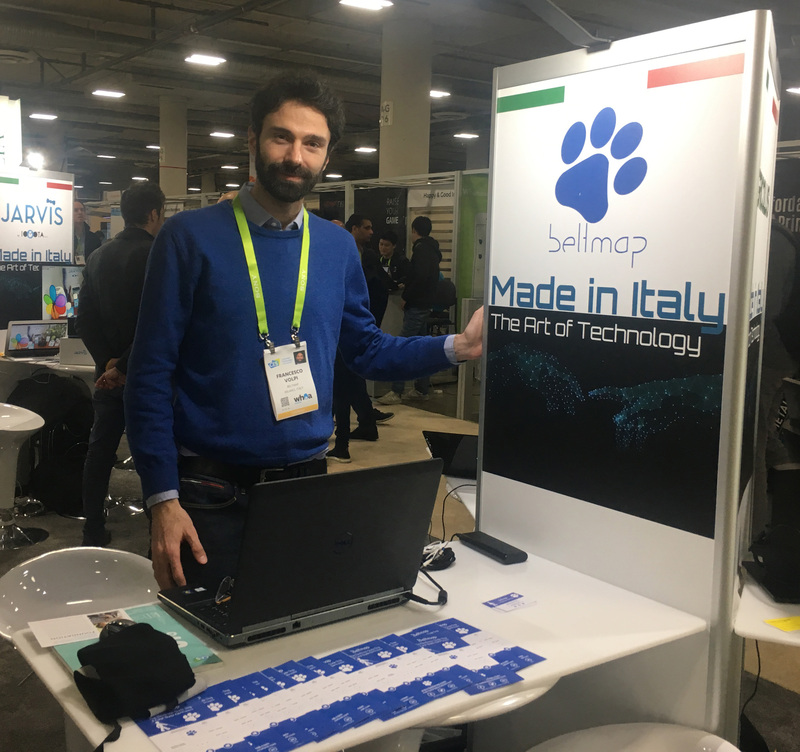 As a first time participant at CES, I was unprepared for the size and number of venues, as well as the amount of people and vendors. 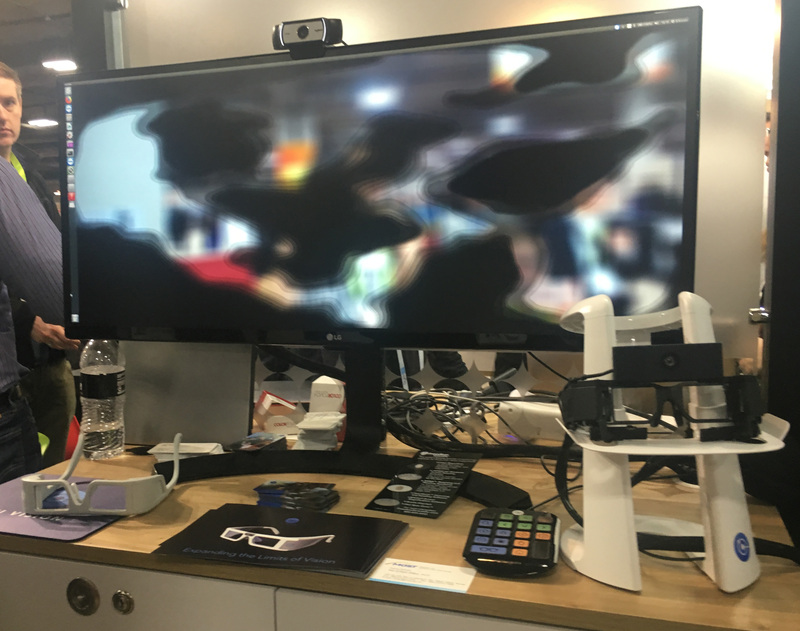 I found the accessibility group that was there with me to review products very helpful and communicative with regards to their strategy on making their way through the event and giving tips on interesting things to see. In the vision loss area, there were many versions of glasses and/or glasses attachments that assisted in seeing text and navigation. I found that there were various grades of the same type of products; some had much more advanced technology than others, such as a product that was wireless and small versus a similar product that was wired and a bit clunky. I have put an asterisk (*) near my favorite products listed below. APH had a new product, Graphiti, which was touch interfacing using variable-height pins. With this device, the user can view graphics imputed via a USB, HDMI or SD port, as well as Bluetooth. The graphic display would present accessible forms of graphics, such as charts, maps, photographs and other dynamic graphical content. 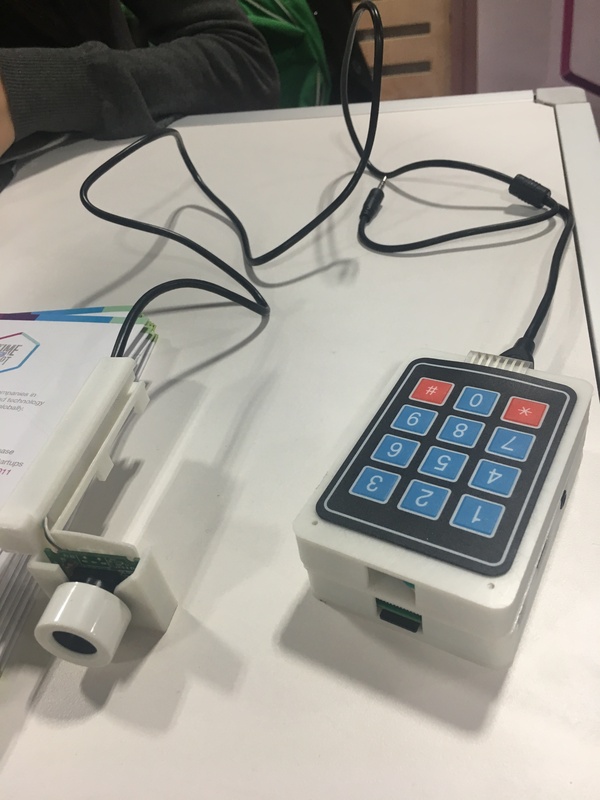 This device also allows the user to draw on the surface; as your finger touches the screen, the pins rise and follow your touch, offering haptic feedback. The price of Graphiti has not been set yet. Beltmap was an interesting concept where an individual would wear a belt that offered navigational directions through vibrations. The Beltmap would connect via Bluetooth to the user’s Smartphone and would use Google maps (specifically) to get directions. As a user walks and turns, Beltmap can tell her direction and give her vibrations on the side where she needs to turn. Once she turns, the vibrations stop, indicating that she is supposed to walk forward until otherwise alerted. The unique aspect to this device is that it is not auditory. The fallback is that it is not yet able to work indoors/on Wifi and thus, could not work in airports or conferences, examples of loud areas where this device could be useful. 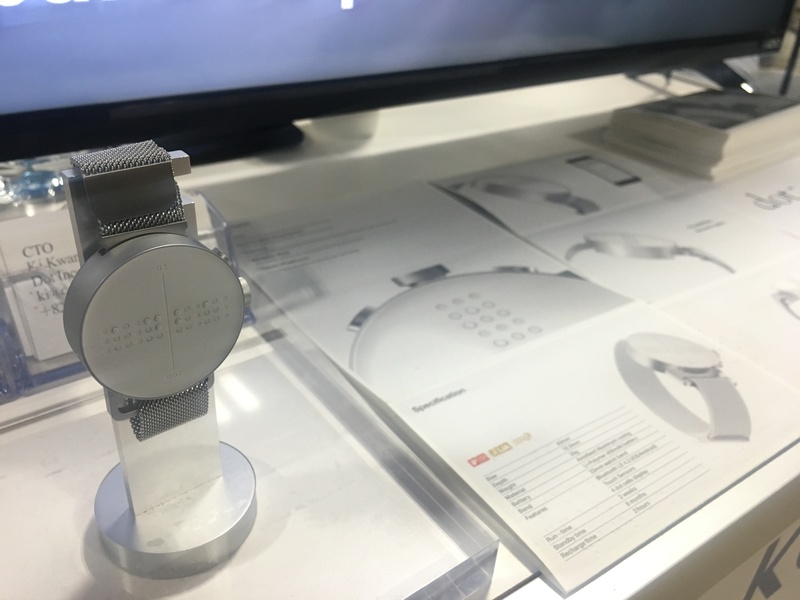 Dot Watch is an attractive, Braille watch that allows you to sync with your Smartphone to check notifications, get alarms and see who is calling. The Dot Watch costs $359.00. FACIL’iti offers a product that can make an existing website more accessible to individuals with vision loss and certain cognitive and mobility disabilities. This system inserts a profile module into an already existing site where an individual will specify his needs. Once the profile is complete, the software will adjust the site in a variety of ways to help make the site more accessible. For example, as a dyslexic user you can specify having an issue with b’s and d’s, and the software code will then identify those letters to you. Other examples of access aides are zooming capabilities, as well as making larger targets for those who have shaky hands. This product is approximately $400.00 to have it added to your website. ICI Vision is a medical device company that has made a pair of glasses that claims to recover central vision due to retinal damage. As it was explained to me, the glasses record video of surrounding areas, and then they project light into the wearer’s eyes that restore images where once the user had blind spots. This device was not able to be tried on at the CES event as it was still in medical trials. The target audience seems to be especially small, and there was no research that could be referenced at their booth. ORCAM MyEye 2.0 is a lightweight device that snaps onto any eyeglass frame magnetically. It reads printed or digital text, recognizes faces and identifies products and common items, such as currency. 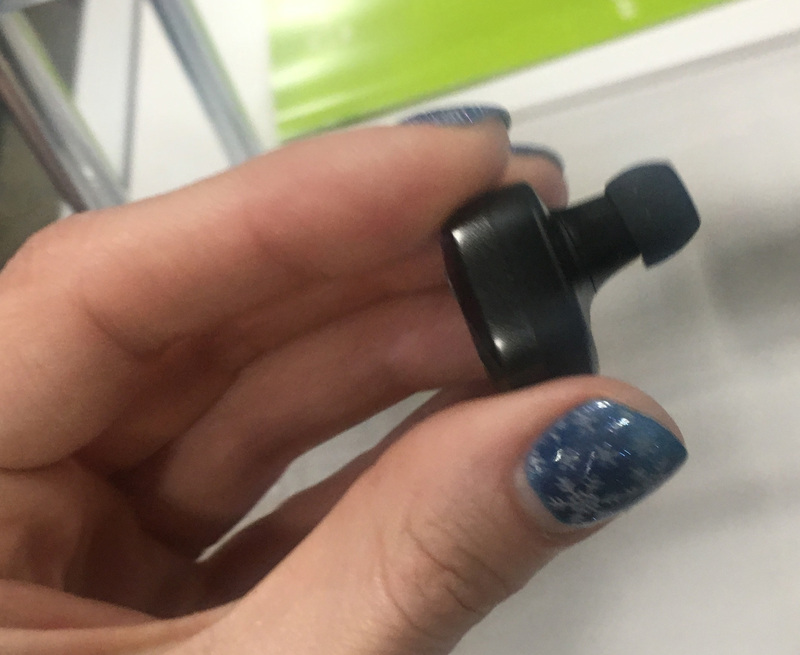 While wearing this device, you can point your finger ahead of you toward the item you want read, and the sound comes out of the back of the device near your ear. This device worked reasonably well and was nicely designed so that it is appealing and pretty discrete. 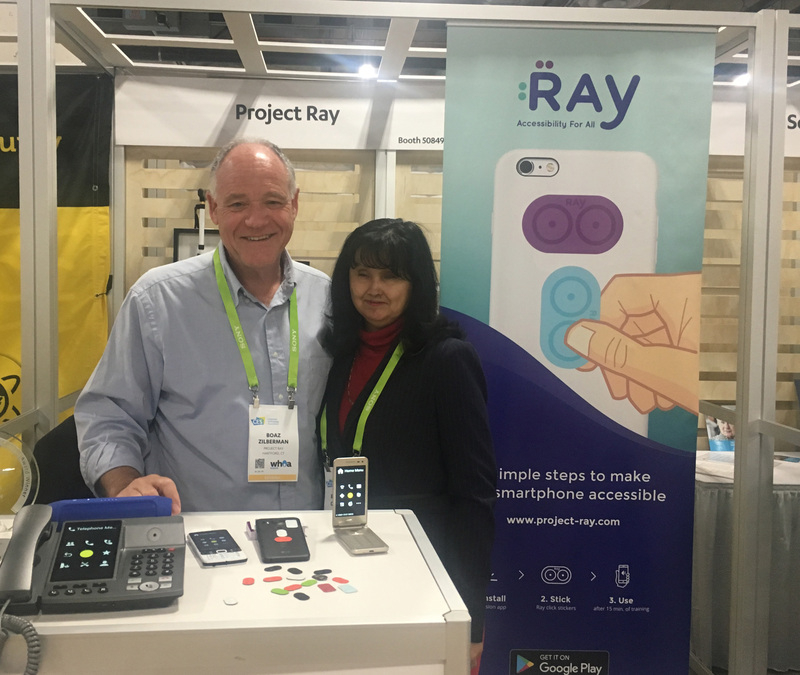 Project Ray provides technology designed to facilitate the operation of common Smartphones by people who have vision loss by allowing them to use any off-the-shelf Smartphones with their tactile stickers that have chips that facilitates phone functions. These stickers are a tactile add-on that have quick function and navigation purposes. The product’s main feature is a simple, unified user interface that is automatically imposed across all system functions, applications and services, using only two types of interactive functions working as an overlay on top of existing mobile applications. This booth was also the only one that had a disabled exhibitor, which was refreshing. Vditory is a pair of glasses that describes the user’s surroundings, including telling him if he is indoors or outdoors and describing the objects around him. Also, if a face were detected, Vditory would tell the user the face’s age, gender, and emotions. The device has face recognition for common faces, as well as color and currency recognition. There is also a GPS tracker and navigational modes. The VFO booth had a very sophisticated, new, multifunctional magnifier. The interface was large, color touch screens that allowed you to pinch-zoom selected areas. The device was also an OCR scanner where you could export data to a USB. Additionally, there was voice output to read selected text. The multifunction of this magnifier was very appealing. The cost of this item was approximately $4,600.00. The Riage X3 chairs by Infinity Massage Chairs come with automated massage programs, but they are also customizable for when you want to target specific muscle groups or areas. One massage ability of the Riage X3 chairs is their L-Track, which covers your upper body vertically down the natural S curvature of the spine then across the lower body horizontally for complete alleviation of spinal tension; this provided long lasting comfort. Another massage ability of the Riage X3 chairs is their reflexology foot rollers to cure fatigue in your feet. Its shifting motion also helps blood circulation. The price point for this item was approximately $7,700.00. Kleiber Bionics was displaying a Bionic Prosthetic Hand for people with various degrees of amputation. It had tactile sensors and varying grasp patterns. The prosthetic was attractive and looked durable and flexible. Unfortunally, it was difficult to get more detailed information from the individuals at the booth. 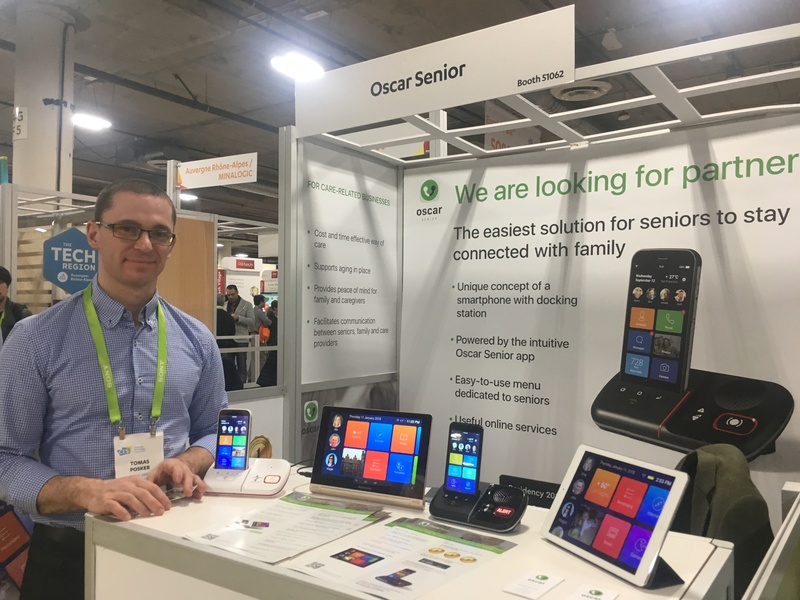 Oscar Senior is a telecom device that integrates Smartphone technology into a large and easy to understand display. It facilitates communication between the user and their families and caregivers with shortcut buttons that use icons and images to help easily identify functions. Functions include video calling, applications and quick web navigation. It’s an attractive design with useful applications. While it is marketed to seniors only, I can see this functionality being useful for cognitive and mobility disabilities, as well. *Oska Pulse – When pain stops, life begins. 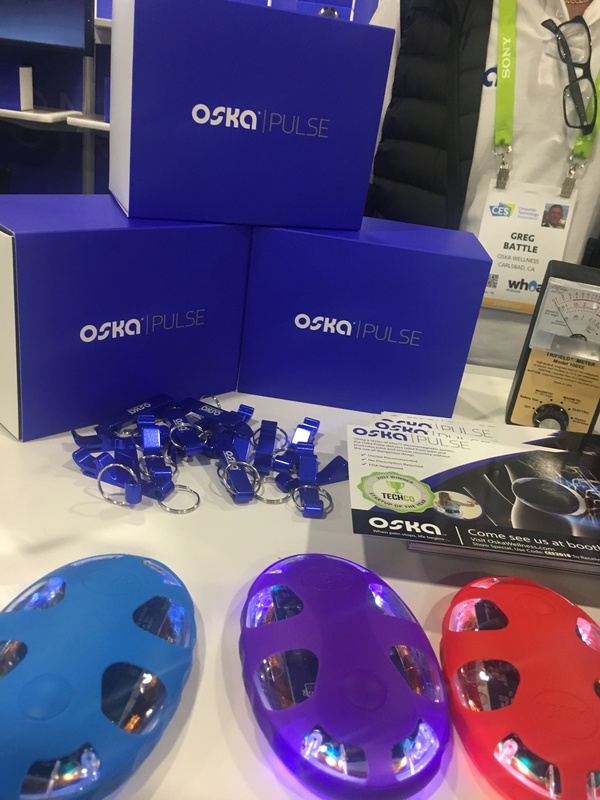 Oska Pulse is a device that uses optimized PEMF to restore the electrical potential cells need to receive nutrients and oxygen, which stimulates cellular regeneration. This relieves pain and activates the body’s natural recovery process. Oska Pulse promotes capillary dilation, muscle ease and pain reduction. It can help dilate blood vessels, which may reduce inflammation, increase blood flow and release the body’s natural endorphins. Additionally, it helps break the cycle of inflammation and pain by activating a cell-specific negative feedback loop that promotes joint and muscle recovery. The device is attractive and able to be worn discreetly. The price of this device is approximately $400. I actually bought this device for my chronic pain, as it is an interesting, non-invasive alternative to similar products. VIVY is a consumer pain management product that offers the deep heating properties of diathermy in a safe, simple-to-use device that’s small enough to carry anywhere. VIVY relieves pain, eases muscle tension and improves joint mobility around chronic pain or joint injuries. It is an attractive, portable device that has a Smartphone app accompaniment. However, VIVY is currently an investigational device only and is not yet available for sale in America. 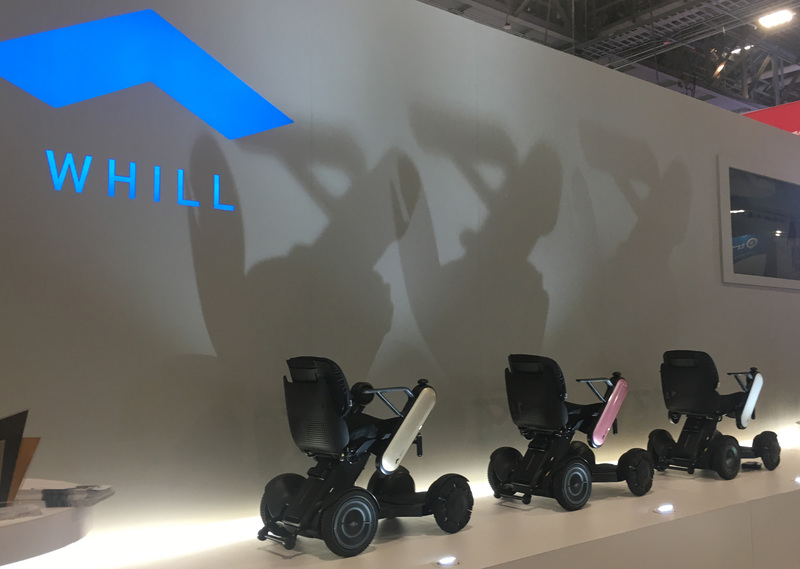 WHILL electronic wheelchairs are compact, attractive, all-terrain personal mobility devices. They have a modern design that is comfortable and ergonomic. They have sensitive joystick controls and all-wheel drive functionality. SignAll is an automated sign language translating system. The SignAll team worked with Gallaudet to record a database of commonly used signs and then created software that could recognize ASL and convert it to text or vice versa. SignAll is still piloting this product and hopes to develop a mobile application version as well as have more language databases. This is an innovative idea for ASL translation with the potential for many future applications. SmartEar is a lighting system for your home that offers alerts. Each light is portable and customizable. With the app accompaniment, you can set alarms with different colors, pulsing of different speeds and duration. The SmartEar devices can hear the auditory cue such as the doorbell, fire alarm or telephone and will display your customized lighted visual alert. Alerts can be queued to all SmartEar devices in the house or just one. This design is practical for use in homes and offices. The Olive Union: Next-Gen Hearing Aid is a consumer-grade hearing aid. The Olive was very nice looking but seemed a bit big. The app accompaniment offers hearing self-test, customized hearing profile and an active hearing status management. The cost of one Olive device is approximately $100. *Noveto’s Sowlo – Sound delivered directly to your ears, and your ears only. Sowlo technology focuses the audio content directly and solely into the user’s ears, all without any intermediate hardware such as earphones. The system constantly tracks the user’s position and dynamically focuses the audio beams to follow the user’s ears, creating unique abilities to consume sound at a higher volume in a personal manner without affecting others’ experiences.